Former Bishop of Derry Dr. Edward Daly, photographed in January 1972 waving a blood-stained handkerchief as he tied to help injured civil rights protesters pass through British troops, died 8 August 2016. He was 82. Here’s the IT’s full news obit, and U.S. coverage from The New York Times. Also, my 2001 report from Derry about the conflict. 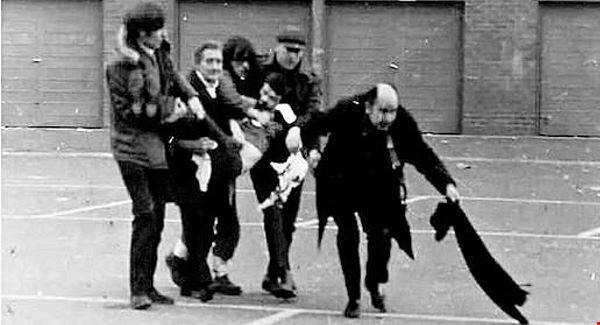 Dr. Edward Daly at Bloody Sunday in January 1972. This entry was posted in History, Northern Ireland, Religion and tagged Bloody Sunday, Derry, Edward Daly on August 8, 2016 by admin.